Rediff.com » News » Will we see an India-China re-set? 'Problems will keep recurring unless China vows to resolve all outstanding issues between the two sides,' says Sana Hashmi. In May 2014, when Prime Minister Narendra D Modi came to power, speculation was at its peak that he might get closer to China than the United States, considering his bitter personal experience with the latter. The first meeting between Chinese President Xi Jinping and Prime Minister Modi in September that year gave a further boost to the perception that he would take the India-China relationship to new heights. However, Barack Obama's charm on one hand, and China's apathy to India's concerns, made such crystal-gazing fall flat. China's opposition to India's entry into the Nuclear Suppliers Group, repeated overlooking of India's concerns on terrorism and trade deficit, and more importantly the Doklam episode brought the relationship to an all-time low last year. Despite efforts by senior officials from both sides, the situation has remained as gloomy and polluted as the weather of the capital cities of India and China. However, with an objective to break the ice, Prime Minister Modi will visit Wuhan in Hubei province, central China, on April 27-28 for an informal summit with President Xi. This is a significant development following the two-month standoff in Doklam, the event which made both sides equate and put Doklam on par with the 1987 Sumdorong Chu standoff which destabilised India-China relations for at least a year. It took a visit by then prime minister Rajiv Gandhi to China in 1988 to restore warmth in bilateral ties. This month has witnessed several back-to-back high profile visits from India. National Security Advisor Ajit Doval held talks with senior foreign policy advisor Yang Jiechi in Shanghai. Doval will visit Beijing in May for the Shanghai Cooperation Organisation national security advisors meeting. Cooperation under the SCO framework is important for India. 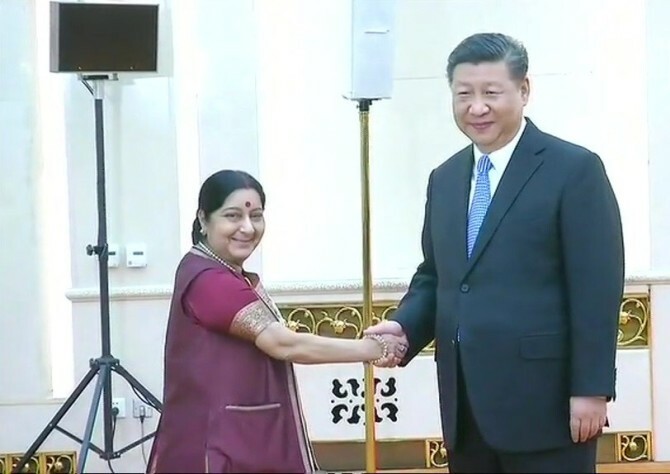 External Affairs Minister Sushma Swaraj and Defence Minister Nirmala Sitharaman also visited China to attend their respective SCO meetings as also to prepare the ground work for Modi's China visit. With all these meetings, hopes are high that India-China relations will come back on track sooner rather than later, with, of course, the Modi-Xi summit in Wuhan leading the way. This is part of Prime Minister Modi's style of giving a personal appeal to India's relations with countries of importance. Also, both Asian leaders will meet at a personal level before the SCO summit in June. China also had such 'informal meetings' with United States President Donald J Trump, and his predecessor Barack Obama. A long-term view of the India-China interaction demonstrates that such upward and downward swings have been a characteristic of their relationship. An element of striking continuity marks the dialogue between the two sides. While Premier Li Keqiang's 2013 visit to India was overshadowed by the three week-long military standoff in India's Depsang Valley, Dr Manmohan Singh's visit in October 2013 resulted in a confidence building agreement, now known as the Border Defence Cooperation Agreement. In sum, there are at least three counts on which Modi's Wuhan visit is crucial. First, its significance lies in the fact that it is taking place at a time when China has abolished a term limit for its president. Both Modi and Xi are aware that a hostile approach will not let the two countries remain in peace, to say the least. The fact that no joint communique or statement will be issued after the Modi-Xi summit indicates that the leaders wish to have a free and frank dialogue, away from the constraints of diplomatic procedures. Such a meeting might provide India and China with more avenues to discuss their concerns. While India can use the opportunity to discuss China's ongoing projects in disputed territory and terrorism in the region, China may use the opportunity to express its concerns on the quadrilateral dialogue between Australia, India, Japan and the United States. Second, China is trying to be a leader of a multilateral world. One of the reasons for the resolution of the Doklam issue was the BRICS (Brazil, Russia, India, China, South Africa) summit in Xiamen in September 2017. Both sides, particularly China, did not want the Doklam issue to take the limelight away from the summit, especially when it was being held in China. This time, the SCO summit is taking place in Qingdao in China's Shangdong province. Given the SCO's importance, both leaders will attempt to improve ties through re-establishing personal rapport. Both leaders have been giving a personal touch to their visits. Modi received Xi in Ahmedabad in Gujarat in September 2014. In May 2015, during Modi's visit to China, in an unprecedented move, Xi received the Indian leader in Xi'an. That was the first time any foreign leader was received by the Chinese leadership outside Beijing. Third, China needs India's endorsement of its One Belt, One Road initiative. Australia, India, Japan and the United States are not willing to be associated with the OBOR and have been voicing their concerns. The OBOR was recently sharply criticised by a report compiled by 27 European Union ambassadors. Despite all efforts, problems will keep recurring unless China vows to resolve all outstanding issues between the two sides. For lasting stability in relations, it may be useful to encourage more such dialogues and informal visits. Sana Hashmi, a regular commentator on Chinese foreign policy, is a researcher at the School of International Studies, Jawaharlal Nehru University. She is the author of China's Approach towards Territorial Disputes: Lessons and Prospects. This article reflects the author's personal views.